A 30-year-old mystery about black holes has just been solved. The story starts in the 1980s, when astronomers found that small (stellar-mass) black holes emit X-ray light that flickers in a curious pattern. At first, this flickering occurs every few seconds; however, the time between each flicker shortens over the course of a few months, eventually stopping completely. "It is a bit like twisting a spoon in honey: Imagine that the honey is space, and anything embedded in the honey will be 'dragged' around by the twisting spoon," Adam Ingram, lead author of a new study describing the findings, said in a statement. "In reality, this means that anything orbiting a spinning object will have its motion affected," added Ingram, of the University of Amsterdam in the Netherlands. Though the observed QPO periods were close to those predicted by this idea, there had not been enough evidence to nail down the connection — until now. Observations by the European Space Agency's XMM-Newton spacecraft and NASA's Nuclear Spectroscopic Telescope Array (NuSTAR) satellite show that matter orbiting close to a black hole moves in paths that wobble in a characteristic way — one that reveals the gravity-twisting behavior of black holes, the researchers said. 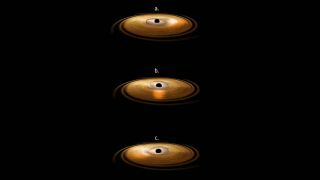 These shifts revealed the twisting motion of the accretion disk, which was caused by the black hole's powerful gravity, the researchers said. "We have spent a lot of time trying to find smoking-gun evidence for this behavior," Ingram said. The new study was published in May in the Monthly Notices of the Royal Astronomical Society. You can follow Space.com on Twitter @Spacedotcom. We're also on Facebook & Google+. Originally published on Space.com.